From lofty mountaintops to city streets, the tourist attractions, Historical sites, man-made visitor sites or natural wonders, form a kaleidoscope of interesting places to see for visitors of British Columbia! BC's variety of cultural and community events offer a glimpse into the background and lifestyle of the people who live here. Whether you venture into BC's outlying areas or stay close to the big city lights there's something for everyone to enjoy. Many visitor sites and tourist attractions offer guided tours that will will take you to these interesting places. Some of BC's most popular tourist attractions include restored historic buildings and historical sites, like Fort Langley, Fort Steele and Barkerville. Enjoy the tranquility of spectacular man-made gardens and parks where walkways meander through beautiful flowerbeds, sculptured shrubbery and native trees. Visit the numerous museums and art galleries, take in a live theatrical show or local performance at one of the many theatres. There are unique malls, boutiques and sidewalk stores offering interesting artwork, clothing and souvenirs made by local artisans. Nightlife ranges from small neighbourhood pubs and eateries to world famous restaurants. Family fun tourist attractions include theme parks, water slides, zoos, wildlife parks and aquariums. Cultural and community events abound. Nature's handy work amazes visitors to the Fraser Canyon and Hell's Gate, Garibaldi Provincial Park, Stawamus Chief, Helmcken Falls, Yoho National Park, the Rocky Mountains, Long Beach and Galiano Bluffs. Other masterpieces that will inspire visitors include Mount Robson, Shuswap Lake, BC's South Okanagan desert, the Queen Charlotte Islands, Liard Hot Springs, historic Nootka Sound, the Peace River, Mount Waddington, Tweedsmuir Provincial Park, and Okanagan Lake home to the elusive Ogopogo lake monster. 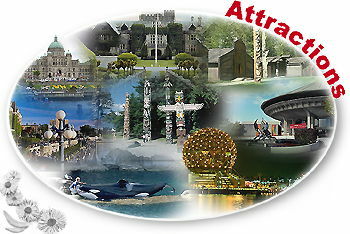 BC's natural wonders and tourist attractions are endless.